Tiger Roll - Is He One Of The All-Time Greats? Any horse who wins the Randox Health Grand National at Aintree in their career, automatically adds their name to the history books, which will remain open to view for generations to come. Ran annually on Merseyside in the spring, the cliche certainly hits the nail on the head when it states the best horse wins the big race, but in this exclusive, rare test of stamina and longevity, the ability to overcome thirty unique fences certainly comes to the fore, along with an element of luck. Very few races in the calendar come close to this event in terms of its' titles and meaning, but many even come close to the distance at hand. Four miles and two furlongs; two laps of the Aintree circuit - it's no wonder why so many horse's who win this race fail to come back to defend their title in the future, let-alone come back and win it for a second time. However, history was made in Liverpool on Saturday afternoon, in the glorious returning sunshine which beamed down on the packed out crowds in the many stands situated at the course. The pocket rocket Tiger Roll - a year older, carrying almost half a stone more than he did last year, recorded back-to-back victories in the world's greatest steeplechase; the first to do so for forty-five years, yet somehow it was even easier for him. A narrow winner in the race twelve months ago, the tiger - who made it four Festival victories last month with a second triumph in the Glenfarcas Cross Country Chase, arrived with the weight of the nation on his shoulders. He travelled ever so well over the uncommon National fences, and cruised into contention after jumping the canal turn for the second time, cutting every corner as it came. The Gigginstown colours were ever-present in the field, but you could see the little horse with a massive heart from a mile-off with his black blinkers applied once more to keep his eyes on the job. A couple of low leaps towards the conclusion of the race did have a few hearts in mouths, but once again he proved how much of a versatile and natural individual he is, as well as his raw class as a racehorse. Jockey Davy Russell merely had to steer him around the elbow before he asked for maximum to seal the deal. The whip was not even required on the nine-year-old as he kept on finding even after four endless miles, and the tiger rolled onto victory - crossing the line where the most prestigious National horse rests - the great Red Rum. So can Gordon Elliott's remorseless Tiger Roll be considered one of the all-time greats? Tiger Roll however joins an exclusive and limited list of National legends - a modest catalogue of horses who managed to secure National success twice in their careers, featuring just nine names in almost 175 years in the history of the infamous event. The term 'legend' is constantly overused in this day and age, and when the time calls to use this description for a horse or rider, it is often discounted or overlooked. But the diminutive Tiger Roll has to be up there with the likes of Red Rum given what he has achieved so far in career that is not over by any stretch of the imagination. 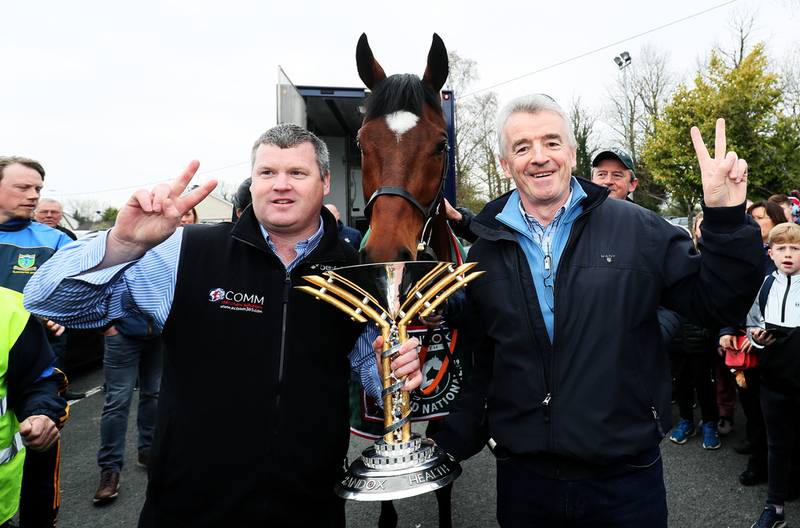 Many followers of the National Hunt scene will recall his owner Michael O'Leary stating at Cheltenham that there were doubts on a return to Aintree this year, which were of course laughed away by Gordon Elliott. After his triumph this time around, there were even cries by many to campaign this horse for the Gold Cup next year - and why not? O'Leary soon intervened and calm down the celebrations suggesting this horse will go for another Glenfarcas Chase at Cheltenham and that may be that.. but if the horse is all well and fine, why would they not go for history and for a third successive National, regardless of the weight he carries! One thing is for certain, is that if O'Leary personally denies the opportunity for this horse to become the first consecutive-triple winner of the race, and only the second to win the race three times in a career, he will have the world on his back and the globe to answer to. Very infrequently do you get a National type come round, who looks so at home over the towering spruce-covered fences at Aintree, that he wins the world's greatest steeplechase with complete and utter ease. Only so often does a horse with a heart of a lion arrive on the scene given his stature, coincidentally falling with the name Tiger Roll. Elegant, palatial, and magnificent. The tiger is already an all-time great, and his name will live long in the memory.